This is an old paper of mine it was published originally on PTT (June 2009). I re-post it following the disappearance of PTT and its Archive. For very many years the Palestinian solidarity discourse was dominated by leftist ideology carried largely by Jewish Marxists. Though the support of Jewish leftists was rather important at an early stage, it lost its primacy and urgency as Palestinian resistance and the Palestinian solidarity discourse evolved into a vivid autonomous discourse based on widely accepted ethical grounds. The Israeli war crimes against Palestinians are now well documented. No one needs the odd kosher ‘righteous Jew’ to approve that this is indeed the case. And yet, in spite of the clear fact that Palestinian solidarity discourse moved ahead, Jewish Marxists are still insisting upon dictating their tribally orientated pseudo-analytical vision of reality. Jewish Marxism is very different from Marxism or socialism in general. While Marxism is a universal paradigm, its Jewish version is very different. It is there to mould Marxist dialectic into a Jewish subservient precept. Jewish Marxism is basically a crude utilisation of ‘Marxist-like’ terminology for the sole purpose of the Jewish tribal cause. It is a Judeo-centric pseudo intellectual setting which aims at political power. Palestinian thinkers were probably the first to realise that the situation in Gaza, Nablus and the refugee camps had little in common with 19th century Europe. This was enough to defy Marxism as a sole analytical political tool. However, the Jewish Marxists had a far more adventurous plan for Palestinians, Arab people and the region in general. They wanted Arabs to become cosmopolitan atheists. They suggested that Arabs should drop ‘reactionary Islam’ and liberate themselves as ‘the Jews did’ a century ago. Seemingly, Palestinian and Arab intellectuals grasped that the method that successfully transformed Russia into a Soviet Union, at the expense of millions, was not going to liberate them. They obviously realised that the Jewish Marxists did not intend upon bringing millions of Palestinian refugees home either. It wasn’t even set to launch any form of an adequate resistance. It was there to saturate the discourse with empty rhetoric and pseudo-analytical jargon in order to divert the attention from questions having to do with Jewish tribal politics and Jewish identity. As interesting as it may be, it is actually the Jewish Marxists, those who support Palestinians as long as they drop Islam, who are the ultimate exemplary exponents of Jewish tribal politics. It is the Jewish Marxist rather than the 'Zionist’ who exposes the Jewish political ugly attitude in its worst crude form. This is good enough reason to monitor the Jewish Left and to understand its philosophy. As we will see soon enough, Jewish Marxism is there to suppress any form of engagement with the Jewish question by means of spin. It is there to stop scrutiny of Jewish power and Jewish lobbying. The Judeo Marxist is an imposter prophet who claims to know the answers and yet, for some reason, his reading of historical events is no less than a total catastrophe. None of his predictions stand the reality test. 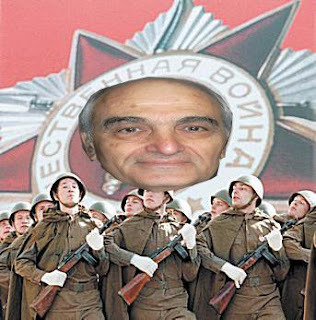 One of the last prime exponents of Judeo Marxist ideology is Professor Moshe Machover. Machover was born in Tel Aviv, then part of the British Mandate of Palestine, he moved to Britain in 1968. He was a founder of Matzpen, a miniature Socialist organisation in 1962. Machover’s reading of Zionism is pretty trivial. ‘Israel’, he says, is a ‘settler state’. For Machover this is a necessary point of departure because it sets Zionism as a colonialist expansionist project. The reasoning behind such a lame intellectual spin is obvious. As long as Zionism is conveyed as a colonial project, Jews, as a people, should be seen as ordinary people. They are no different from the French and the English, they just happen to run their deadly colonial project in a different time. However, as much as Machover is desperate to divert the attention away from the Jewish question, Jewish tribal politics and the Jewish identity, his entire premise can be demolished in a one simple move. If Israel is a ‘settler state’ as he says, one may wonder, what exactly is its ‘motherland? In British and French colonial eras, the settler states maintained a very apparent tie with their ‘motherland’. In some cases in history, the settler state broke from its motherland. Such an event is a rather noticeable one. The Boston Tea Party may ring a bell. However, as far as we are aware, there is no ‘Jewish motherland’ that is intrinsically linked to the alleged ‘Jewish settler state’. The ‘Jewish people’ are largely associated with the Jewish state, and yet the ‘Jewish people’ is not exactly a ‘material’ autonomous sovereign entity. The lack of material Jewish motherland leads to the immediate collapse of Machover’s colonial argument. Moreover, native Hebraic Israeli Jews are not connected culturally or emotionally to any motherland except their own state. As an ex-Israeli, I can testify that neither my parents nor myself or any of my fellow expatriates have ever been aware of our ties to any other (mother) state except Israel. Accordingly, it may be true that Zionism carries some colonial elements and yet, it is not a colonial project per se, for no one can present a material correspondence between Jewish ‘motherland’ and a Jewish ‘settler state’. The Jewish national project is unique in history and as it seems it doesn’t fit into any Marxist materialist explanation. We are therefore entitled to assume that Machover’s ‘settler state’ is just another Judeo Marxist spin that is there to divert the attention from the clear fact that Israel is the Jewish state. In order to understand Israel’s unique condition we must ask, “who are the Jews? What is Judaism and what is Jewishness?” In fact answering these questions will help us understand why Machover and other Jewish Marxists invest so much effort producing all those spinning lines. As interesting as it may sound, Machover’s alteration of Marx’s ideology is very similar to the Zionist distortion of the Old Testament. Machover’s recent publication is a pompous lengthy talk delivered in November 2006 at the Brunei Gallery Lecture Theater (SOAS). For some reason it was published this month by the ‘International Socialist Review’ (ISR). Considering the embarrassing fact that none of Machover’s prophetic predictions ever stood the reality test, the publication of such an embarrassing paper raises serious concerns regarding the editors of the ISR’s understanding of world current affairs. It would be very interesting to learn from the ISR whether they approve Machover’s suggestion that Islam “is backward looking and inherently unable to deliver progress.” It may also be important to make sure that every Muslim on this planet grasps that an Elder Jew Marxist from London is convinced that they should throw away their Qur’an. I may as well mention that here in Britain and in some other European countries more than just a few people are concerned with the latest rise of nationalism. Shockingly enough, comparing Machover’s pretentious and supremacist take on Islam with rightwing nationalists reveals a very amusing fact. As it happens, Machover, the supremacist tribal Jew, has managed to locate himself on the right of Nick Griffin and the BNP. While Griffin is kind enough to offer ‘foreigners’ £50,000 to go back to their ‘homeland’, our Kosher Marxist Machover is set to rob the indigenous of his belief on his land. Griffin would not be able to get away saying about Islam that it is 'backward looking'. This is hardly surprising, while Griffin has to meet a vast opposition, Machover would have very little opposition within the left. One reason is obviously due to the fact that Machover and his three Jewish supporters are unnoticeable. Another reason may be that racism and supremacy is, unfortunately, a Jews only territory. As we can see Machover is getting away with it. Hopefully, this will change soon. I may admit that when a Jewish marginal Marxist voice utilises the “we”, ”should” and the “ought”, my red alert light turns on. I recently read about some Bolsheviks who held similar ideas to Machover’s did to Ukrainians peasants in the name of just another “we”. Machover dares to come with a pretence of an analytical argumentation that will produce a concept of resolution. “Understanding,” he says, “ought to precede judgment.” Someone should remind the Hebraic ‘prophet’, who probably failed to read a single philosophical text in the last 50 years, that ‘understanding’ is itself subject to prior ‘understandings’ and ‘judgments’. In fact Machover’s own systematic failure to understand the power of Islam and Arab resistance is in itself due to his own prior understandings and some severe Judeo Marxist indoctrination. It would take Machover many thousands of words of pseudo-analytical text before he outlines his vision of ‘Resolution—principles and preconditions’. “Above all,” he says, “pressure must be applied on Israel to end its military occupation of the West Bank, the Gaza Strip and the Syrian Golan Heights.” “Equal rights”, he affirms are “essential elements that a lasting resolution must embody”. This is quite an astonishing insight from a man who claims to understand the conflict. In spite of his ‘analytical research’ Machover somehow failed to realise that the Jewish state is not going to willingly approve any form of equality, for Jewish political ideology does not succumb to the belief in human equality. This is indeed beautiful and correct and yet, Machover fails to tell us what is going to lead the Israeli Jews to give away their little ‘Jews only state’. Machover eventually comes with a very simple resolution. “The third and most fundamental element in a genuine resolution is removal of the fundamental cause of the conflict: the Zionist colonisation project must be superseded.” I may stress at this point that Moshe Machover is not one of my satirical fictional characters. He is real and he even has at least 3 Jewish Marxist followers. The crucial question here is how these 4 Judeo Marxists are going to sell this reasonable idea to the Israeli Jews? Like other deluded solidarity campaigners who fail to realise that the Palestinian future will be determined by ‘facts on the ground’, Machover engages himself in the one state/two state academic resolution discourse. “For a two-state setup to satisfy them, Israel would have to be de-Zionized: transformed from an ethnocratic settler state into a democratic state of all its inhabitants.” For some reason, Machover, who doesn’t even live in Israel, believes that he can tell the Israelis in what kind of country they should live in. “On the other hand, a single state would have to be not merely democratic (and hence secular) but have a constitutional structure that recognizes the two national groups and gives them equal national rights and status.” Once again the Elder Jew Marxist, the embodiment of the ultimate possible marginal voice, is telling the Palestinians and the Israelis that if they want to live together they better be secular. One should admit by now, it indeed takes some chutzpah to be a Judeo Marxist. After 22 pages of Marxist self-indulgence on the verge of verbal masturbation, the man himself comes with the necessary goods. He admits that he was wasting the time of his listeners. So in case you happen to wonder what may bring a change. Here it is. ‘Moishe of Arabia’ has two answers to offer. “First, decline in American global dominance” as if Israel is bound to crash with its current allies. As Machover knows, Jews changed their allies rather often in the last century. “Second,” he continues “a radical-progressive social, economic and political transformation of the Arab East, leading to a degree of unification of the Arab nation—most likely in the form of regional federation.” Seemingly, the archaic Marxist fails to gather the most obvious evolving story, the Arab nation is largely Islam. Arab people are becoming more and more united around their love of Allah and the notion of Ummah. As far as reality is concerned, Islam is the rising force, whether our four Judeo Marxists like it or not.stunning win in the first Palestinian parliamentary election which it has taken part in. Would elections take place in the PA today, the Hamas victory would even be greater. Considering the fact that Islam is the only successful resistance force against Western colonialism and the Zionist war machine, the fact that ISR published Machover’s Judeo-centric intellectually lame analysis is there to prove that the time may be ripe for Socialists and Marxists to save themselves from the Judeo political grip. In 1884, in his invaluable paper ‘On The Jewish Question’ Marx argued that for the world to emancipate itself of capitalism, it should liberate itself of the secular Jew. I do not know much about people liberating themselves. I would narrow it down and argue that for Marxist and socialists to liberate their discourse in accordance with their master mentor, they may have to consider liberating themselves of their tribal infiltrators. As we saw before, in terms of tolerance and ethics, Machover positioned himself to the right of Nick Griffin and the BNP. In terms of political pragmatism, he is to the right of Shimon Peres and his ‘New Middle East’. Machover has his own plans for a New Middle East. He is going to unite them all and throw their Qur’an away. Interestingly enough, Moishe of Arabia comes with these embarrassing lines in November 2006, just 5 months after the Shi'a Hezbollah gave a signal of support to its Sunni brothers in Gaza, reminding Israel that they were just to the north, and wide awake, serving the Israeli army with a humiliating defeat. The Marxist elder comedian gave his 2006 talk less than a year after Hamas has scored a remarkable victory in democratic elections. In fact, many Socialists and Marxists do, especially out of the Anglo-American world. However, those Marxists and Socialists who keep spreading anti-Islam views better just join the Jewish Lobby, Wolfowitz and the Neocons and the NJF. They better do it because this is where they belong. “What is the secular basis of Judaism? Practical need, self-interest. What is the worldly religion of the Jew? Huckstering. What is his worldly God? Money. Very well then! Emancipation from huckstering and money, consequently from practical, real Judaism, would be the self-emancipation of our time.” Karl Marx On The Jewish Question, 1844.